For testing purposes it can be useful to enable protocol logging on the POP3 and/or IMAP4 service. 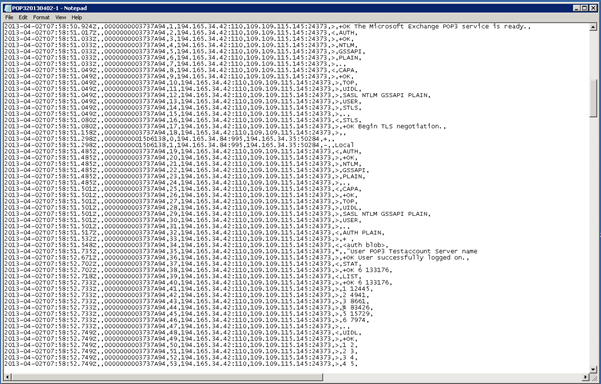 In Exchange 2010 this cannot be done using the Exchange Management Console or the Exchange Management Shell like you would do to enable protocol logging on the Send or Receive Connector but needs to be done using a config file. There’s a Microsoft.Exchange.Pop3.exe.config or similarly a Microsoft.Exchange.Imap4.exe.config file located in the directory C:\Program Files\Microsoft\Exchange Server\ClientAccess\PopImap on the Exchange 2007/2010 Client Access Server. Set-PopSettings -ProtocolLogEnabled $true -LogFileLocation "C:\Pop3Logging"